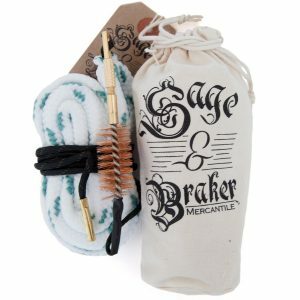 You just bought your new gun cleaning kit, so now what? The first thing you’re going to want to do if you’re new is to watch a few YouTube videos and read the instructions. Each gun is a bit different when it comes to cleaning, so you want to read and re-read the owner’s manual for your particular gun. 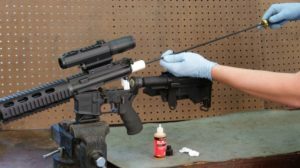 We’ll go over the basics of using a universal gun cleaning kit if you own a rifle, handgun or shotgun this is what you’ll want to use. 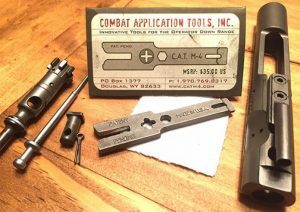 AR’s can be a little different to clean and usually require special tools such as an AR cleaning tool. Almost all new guns come with a bunch of grease and sticky solvent on them. This is to make sure they don’t rust while sitting on the shelf for months or years. This lubricant they put on it is not a shooting lubricant, so you want to remove it and clean your new gun as well as possible. You should always do this because you don’t know how it works until you take it apart. You should ALWAYS inspect a new gun before firing it, looking for worn components, broken or little pieces of sawdust and what not in the gun. I got issued a brand new, out of the package M4 right before shooting the range and skipped cleaning, just wiped the crap off the outside. Had a brass over bolt failure on round 76. Be sure to wash your hand before doing anything. This will help prevent oils from getting onto the outer and inner parts of your gun. Most people, including myself, wear gloves when cleaning their guns to prevent oil absorbing into the skin. If you’re cleaning your guns for years, then the risk of getting some of these solvent into your skin will not be very good for. The disposable black nitrile gloves are my personal favorite and a favorite among many. Make sure the ammo is out of reach. There is a possibility that you could accidentally discharge your gun while cleaning it, if it were loaded. There’s also a small chance that you could shoot a box of ammo, so double and triple check this step. 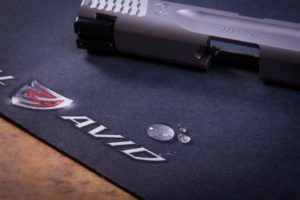 If you have a gun cleaning mat, this is the time to use it. I would highly recommend using something to protect your surfaces from solvents and scratches. To save time you can use a bore snake before using your cleaning rods. This will remove some of the gunk and only takes about 10 seconds. Using a bore snake will save you quite bit of time. Read your manual and take apart everything accordingly. If you don’t have an owner’s manual you can usually find this on their website or even better find a YouTube video and follow along. If you have a gun cleaning vise then you’ll want to secure it properly. A gun vise is amazing for keeping your gun steady and works amazingly well for long guns. Not really necessary for handguns. Assemble your cleaning rods and choose the proper sized brush. You want to start off with a bronze cleaning brush and use your favorite gun cleaning solvent. Make sure to PULL the brush through about 5-10 times. Be sure to pull only and don’t push. Running the bore brush only in the same direction the bullet travels will prolong the life of the barrel. The goal is to have the cleaning patches come out white. You can use 10-20 cleaning patches until this happens and they’re cheap so don’t worry. If you pull out your cleaning patches and they’re black then you need to run your brushes through your gun again. To do this you should use dry cleaning patches and gun mop attachment. After the cleaning solvent is all out you’re going to want to apply some lubricant. Hoppe’s makes a good gun lubricant that you should apply after you’re done cleaning. What this does is protect from dust accumulating on your gun, which will leak to gunk buildup. You can use the double-sided wire toothbrush for this task. Simply put a little bit of CLP on the brush and scrape off any areas that need to be cleaned. You want to be a little bit of lubricant around the mechanics. Also look for any small rust area. Often times rust will start out as a little tiny speck and if you don’t spot it right away it can easily spread. After washing your hands again, you should rub a little oil on them and this will remove any fingerprints that may have gotten on your gun while cleaning it. Now you’re just about finished. You want to make sure your hands are oiled up with your lubricant and put all the pieces back. This is the process to follow for MOST firearms. 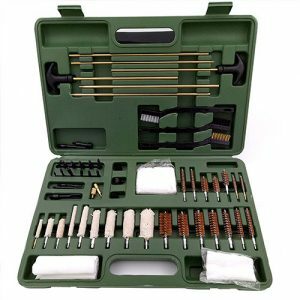 Each gun cleaning kit has different components but most of them have the same type of brushes and rods. If you’re unsure how often to clean your firearm, it really depends on how often you use it and the type of ammo you’re using. Many people treat their guns like their children or pets and must give them everything they need in order to be happy. A popular question we often get is if it’s possible to over clean your guns? No but you can damage your gun AND effect its accuracy by cleaning it improperly. Let’s discuss some tips to help you avoid damaging your firearms. If you clean your gun very often you may find yourself in danger of damaging the rifling or the crown IF you use bad cleaning rods. This is the biggest concern because aluminum cleaning rods can EASILY scratch the inner barrel, assuming you clean from the muzzle. You can easily avoid this by using a good cleaning rod, such as carbon fiber cleaning rod which will make it damn near impossible to damage the barrel. These are a bit more expensive but totally worth it. I own several Tipton carbon fiber rods and it’s a night and day comparison between these and cheap brass cleaning rods. However, the question is: Just how easy is it to damage the rifling? If you’re using bad cleaning rods, cheap brushes, bad cleaner and you’re an average shooter, it’s still pretty hard to damage the rifling. You want to stay away from the aluminum cleaning rods, as these are the most likely to scratch your barrel. Metals such as brass and carbon allow are MUCH better for this and won’t scratch the barrel. The easiest and more inexpensive way to avoid all of this is to use a universal bore guide with your cleaning rods. This should be used when you clean from the breech and make sure you use the right size brushes and tools. This is probably the best thing you can add to your kit for a few dollars in order to ensure that you don’t accidentally scratch the rifling. A bore guide is easy to use and comes in very handy when you’re dealing with several different firearms. 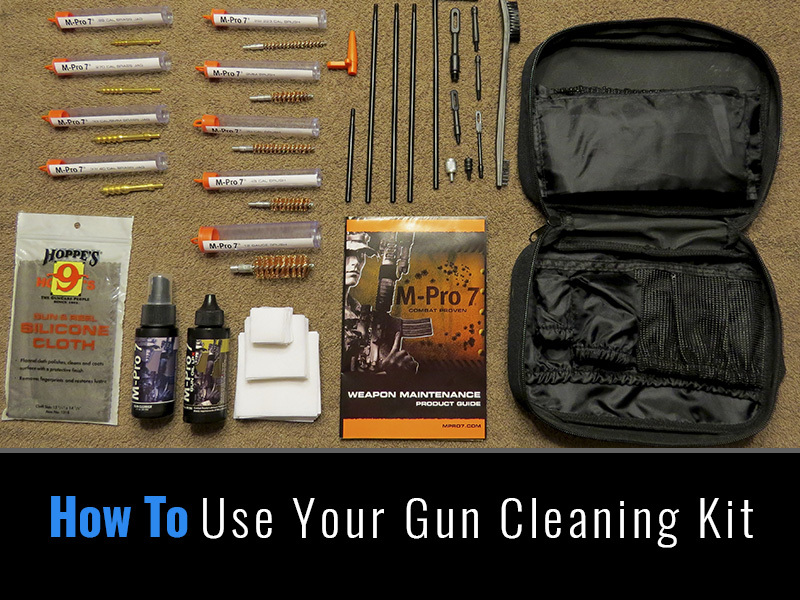 The other biggest factor that can affect your gun is the cleaning solvent that you’re using. A bad cleaning solvent, such as a gummy oil like REM Oil will tend to give you a long-term buildup of crud. 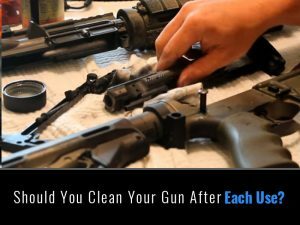 You want to use the best gun cleaning solvent you possibly can in order to avoid dust from attracting to your guns, which will lead to gunk and crud. A simple way to prevent damaging your gun is to use a good bore snake. While you’ll still want to use your cleaning rods, it’s a good idea to use a bore snake in order to prevent damaging the crown and rifling. Bore snakes won’t clean the barrel 100% and its considered the lazy way to clean a gun but it does have it’s place. If you use a good cleaning rod and clean your bore after using a bore snake, you’ll notice that you missed a lot of gunk in all of the groves. A bore snake is great but it won’t remove copper fouling all the way. However, some guns such as AR-15s can get away with just a bore snake and a AR cleaning tool. What may be dirty to me may not be dirty to you. Have you ever cleaned something thinking that it’s clean, only to hear other people say it’s a mess? When it comes to your guns, it doesn’t matter if you think it’s clean, what maters is if it IS clean. Back in the days of black powder and muskets, you had to clean your guns to make sure they worked properly. It was usually advisable to clean your gun after every use. The older black powder, smokeless powder and primers ALL have corrosive elements that would almost instantly rust a gun barrel if not cleaned. Modern ammunition is very clean in comparison and doesn’t require you clean as much. Also, keep in mind the copper fouling is different from residues left by powder and this is another reason you need to clean your gun more often. By using good cleaning rods, a bore guide and good cleaning solvent, you can easily prevent 99% of gun cleaning problems. 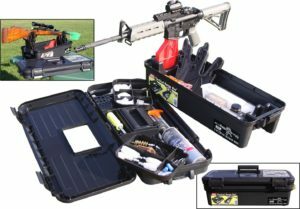 If you care about your guns then spend the extra time to get a good gun cleaning kit and the best cleaning supplies out there, while you still can! I don’t put any of my guns back in the safe until they’ve been cleaned. The process of firing a gun is very dirty and even after firing one shot you can see noticeable debris in the barrel. If it’s a blow-back operated gun then you also get gas pressure entering the action, which also spreads debris on the internal components. Some people clean their guns very little and others (like myself) can’t sleep well if their guns are dirty. One of the main things that will determine how often you need to clean your gun is the type of ammunition you’re using. If the ammo has a corrosive priming the iron based metals will start to rust as soon as your done firing. This is especially true for the bore if the weather is hot. If you’re using corrosive priming then you’re going to want to clean your gun right away! First, you should know that there is no such thing as a slightly corrosive primer. It’s either corrosive, or it’s not! Second, the cost of the cheaper surplus ammo isn’t really worth the time it takes to clean your guns. Cleaning your gun only once after firing corrosive ammo is generally not enough and that’s why it should be avoided. Most modern ammo is not corrosive but the old military surplus is and you need to watch out if you’re firing these. There are two main types of primers; Berden and Boxer. These are the most popular primers used today and almost all military and civilian ammo use them. They came out in the late 1800’s and become even more popular. Not all Berden primers are corrosive BUT just about all surplus ammo that you find will be corrosive. Most indoor shooting ranged prefer Boxer primer with brass casings. If you’re not getting surplus ammo then you won’t need to worry about this and you should be fine. This is generally Non-USA ammunition but ironically was designed in the USA. Since it’s pretty hard to come by Boxer primer ammo in the USA, I won’t go in to too much detail since it’s not corrosive. A chlorate type salt is the corrosive element that will make you have to clean your gun a lot more often. Many of the best gun cleaning solvents won’t remove this salt and you will need to use a machine to remove it in most cases. Today, most primers that are available to the public are Lead Styphnate based. This type does not leave much residue in or on your firearms. Therefore, it’s not really necessary to clean right after firing if you’re using this kind of ammo. However, it’s always a good idea to run a cleaning patch with some gun cleaning solvent on it through the bore and over the exterior of your gun as well to protect from rust. When to Field Strip Your Guns? If you’ve never fired a gun that’s been properly stripped and cleaned, then you’ve never fired a gun! The gunk and grime can get everywhere and in every nook and cranny. Personally, I field strip after every type I shoot and I do this because the mess made from not cleaning can be a BIG headache..
Generally you’ll want to field strip semi-auto guns with a lot of blow back MUCH more often than bolt-action. For the most part I don’t field strip bolt, lever and pump-action firearms after each use. Pistols should get a FULL field strip and clean after each time you fire them. The reason you want to field strip as often as possible is to avoid carbon buildup, which can be very tough to remove. When I first started shooting I never imagined field stropping and cleaning my gun after firing it. After years of experience, I couldn’t see it any other way. If you don’t have the time to do this then at least you should be using a bore snake to clean your gun. I use my bore snake at the range all the time. The general advice is to clean your gun barrels at the very least after each time you fire. New guns are easier to clean and if you field strip clean often, you’ll find it’s MUCH easier to clean your guns. 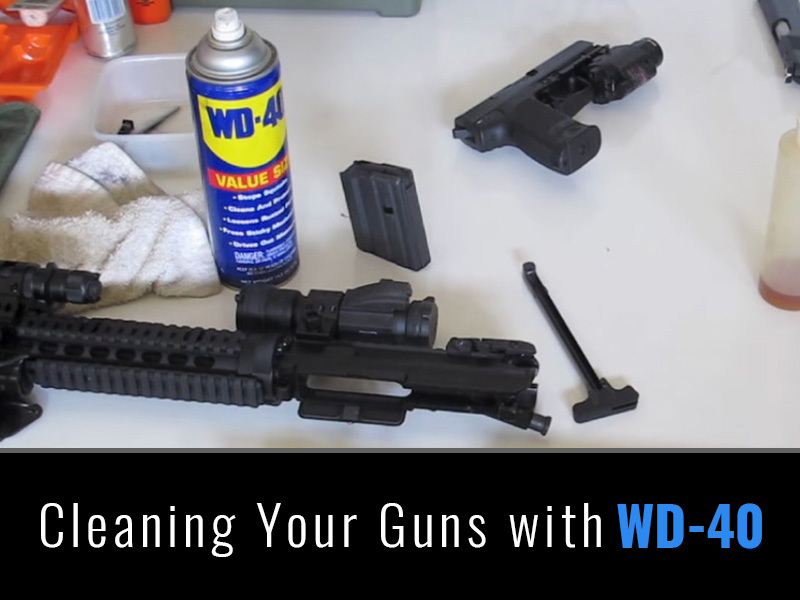 You should ALWAYS clean your gun within a few days of shooting it. You don’t need to clean in 5 minutes after you fire but generally within one week will be fine. Things you need to consider are the type of firearm, the age, and the type of ammo. 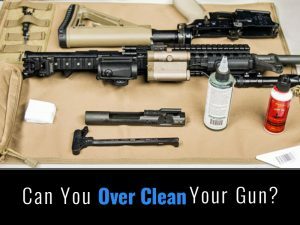 Hopefully this article covered most of that and now you should know when and how often to clean your firearms.